RIO DE JANEIRO, BRAZIL – The World Press Photo awards is the most prestigious recognition of press photography, and from May 21st until June 23rd the winning images are on display in Rio de Janeiro at Caixa Cultural in Centro. Along with the exhibition of winning photos, Felipe Dana, a Carioca photographer, received an honorary mention. 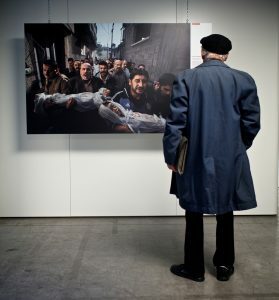 A visitor in front of this year’s winning photo at World Press Photo exhibit, photo by Thomas Leuthard/Flickr Creative Commons License. This year 154 photos won a prize from 54 photographers of 32 different nationalities, which are all on exhibit. These were selected from 5,666 photographers in 124 countries who entered 103,481 photos to the contest. This year’s winning photo, the Press Photo of the Year, was taken by Swedish national Paul Hansen.”Gaza Burial” shows a heartbreaking scene from Gaza, where the bodies of two brothers, aged two and four, are carried to their funeral after an Israeli missile strike. However, some controversy arose over the photo’s excessive lightning. After some claimed it to be fake or composed of several images, World Press Photo judges cleared Hansen of all accusations, stating that although he used quite a bit of post-production techniques, these were still within the accepted standards of retouching. Carioca Felipe Dana’s portrait of Natalia won an honorary mention, photo by Felipe Dana. Brazil is also represented among the winners of the contest. 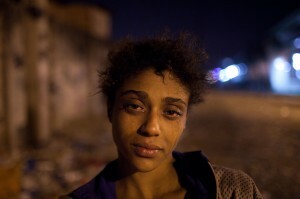 Felipe Dana, a Carioca photographer, received an honorary mention in the category of contemporary issues, with his portray of Natalia, a fifteen year old crack user. “Her photo is part of a story I was shooting for a long time last year on the crack epidemic… I saw her in the manguinhos crackland, when we began talking to her… She was telling her story, and got really emotional, we looked into each other, through my camera of course… that’s when I took a few photos of her,” he told The Rio Times. Belgian photographer Frederik Buyckx also received an honorary mention for his photo story in Rio de Janeiro in the category daily life. He portrayed the pacified favelas of Rio in twelve pictures. The World Press Photo is an independent NGO from Amsterdam, Netherlands who holds a yearly contest of the best press photos in the world. The photos are evaluated upon news value and the photographer’s creative skills by nineteen judges from all over the world. World Press Photo created the contest to connect the photography professionals to the general public. As they state on their website, winners make headlines around the world, so the “inspirational role of photojournalism” is brought to a wide audience. The exhibit in Rio takes place at the first floor of Caixa Cultural in Centro. It is open from Tuesday to Saturday 9AM to 9PM. The entrance is free. Some of the images are very strong, so Caixa recommends a minimum age of sixteen for entrance.